Welcome to Ransin Injury Law’s Ozarks Safety and Awareness. We have partnered with KOLR 10 to create news segments, which bring to light the organizations, safety tips and educational programs that will help our community reduce accidents on our Missouri roadways, waterways and more. David will host these segments with Tom Trtan. Tom has been a staple of KOLR 10 for many years as a weatherman and is the co-anchor of Ozarks Live at 4pm. As a personal injury attorney, David has developed a passion for advocating safety. For the last 30 years, he has helped auto accident victims, and their families recover from the devastating results of serious auto accidents. With this experience, David thought it would be an important to create an entertaining and educational TV show that would highlight some of our community’s distinguished local organizations that help make our community safer. Our show airs each Wednesday at 4pm on KOLR 10. We hope you enjoy this new endeavor and encourage you to contact us to submit your own story ideas. 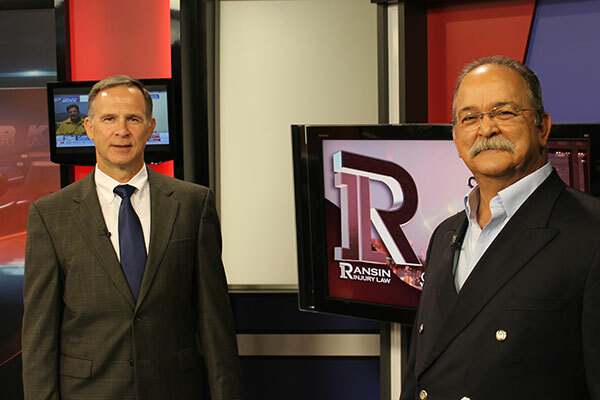 Welcome to the first episode of Ransin Injury Law’s Ozarks Safety and Awareness. In this episode, we are at S and H Farm Supply in Rogersville to explain to viewers the dangers of distracted driving on Missouri’s roadways. Over the series of these segments, we explain the dangers of texting while driving, drinking and driving as well as demonstrate other driving practices that many people do, but do not associate with distracted or dangerous driving. In this episode, KOLR 10’s Tom Trtan and David take us through our causes and why we decided to create this unique weekly TV segment for the education of our community and hopes to reduce the amount of accidents we have in our community. In this episode, we highlight the small things many drivers do that they simply do not think about how it puts them, their passengers and other drivers at risk. To demonstrate this, we have Tom Trtan drive through our obstacle course while trying to eat a bag of pretzels and drink a bottle of water. In this episode, we talk about cell phones, specifically we look at the dangers of texting while driving. Both nationally and here in Springfield, texting accidents are on the rise. In fact, texting has replaced alcohol as the #1 cause of young driver deaths in the nation. Tom will try to send David a short text while he navigates through our obstacle course at S and H Farm Supply. You will see this is too much for him as he crashes through this course. Texting while driving is a main focus of education by Ransin Injury Law. We would like to encourage you to please “Stop Driving Intexticated.” David has been advocating this message to Missouri’s youth and will be launching a new campaign in the fall that will be featured on this weekly show. Drinking and driving is perhaps one of the best examples of what education and promotional safety campaign can do. In Missouri, as well as the country we have seen a decrease in alcohol-related deaths on our roadways. However, this is still one of the leading factors of roadway deaths, and we wanted to showcase just how dangerous drinking and driving can be. In this episode, Tom wears “drunk goggles” provided to us from the Missouri Safety Council, as he drives through the obstacle course. The goggles showcase a driver who is past the legal limit of .08, but not extremely intoxicated; say at a 1.3 or higher. The purpose of this episode is to showcase that even after just a few drinks; your judgment and motor skills are affected and cause driving limitations to occur. Ozarks Safety & Awareness was lucky enough to partner with the Missouri Highway Patrol. Sargent Pace is in charge of public relations and will be a fixture on our weekly segments. In our distracted driving series Sargent Pace gives us important facts and knowledge straight from the Missouri Highway Patrol. We would like to thank Sargent Pace and the Missouri Highway Patrol for their help and valuable input.